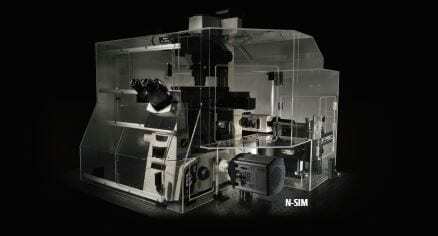 Super-Resolution Microscope N-SIM | EINST Technology Pte Ltd. Structured illumination super-resolution microscope delivering twice the resolution of traditional diffraction limited microscopes. Super-resolution microscope visualizing cellular structures and molecular activity at resolutions never before achieved by conventional light microscopy. 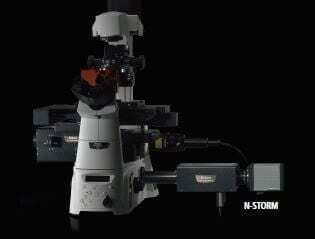 Nikon’s N-SIM microscopy system can produce twice the resolution of conventional optical microscopes. Using an innovative approach based on Structured Illumination Microscopy technology licensed from UCSF, the N-SIM enables detailed visualization of minute intracellular structures and their functions. 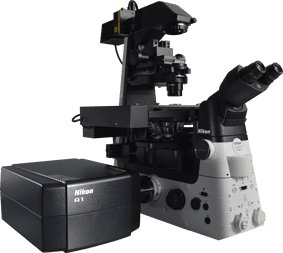 N-SIM doubles the resolution of conventional optical microscopes (~115nm in 3D SIM mode*) by combining “Structured Illumination Microscopy” technology licensed from UCSF with Nikon’s renowned CFI Apo TIRF 100x oil objective lens (N.A. 1.49). * resolution will depend on laser wavelength and imaging mode. Macrophages (J774 cells expressing mVenus-SNAP23) phagocytosing opsonized beads that were incubated with Alexa555 labeled secondary antibodies after fixation. The beads without red signals are in phagosomes containing mVenus-SNAP23. Photographed with the cooperation of: Drs. Chie Sakurai, Kiyotaka Hatsuzawa and Ikuo Wada, Fukushima Medical University School of Medicine. The SR (super-resolution) objectives have been designed for new applications that break the diffraction barrier. The most recent optical designs using wavefront aberration measurement have been applied to yield superb optical performances with the lowest asymmetric aberration. N-SIM provides the fastest imaging capability in the industry, with a time resolution of 0.6 sec/frame, effective for live-cell imaging. Live-cell N-SIM imaging of mitochondria labeled with Mito-Tracker red. Live-cell imaging with N-SIM reveals dynamics of mitochondria at twice the spatial resolution. Cristae in mitochondria are also clearly observed. The combination of fast image capture and the availability of stage top incubation allows live cell imaging at twice the resolution of conventional microscopes. Bacillus subtilis bacterium stained with membrane dye Nile Red (red), and expressing the cell division protein DivIVA fused to GFP (green). N-SIM enables accurate localization of the protein during division. The 3D-SIM illumination technique improves axial resolution to 269 nm and has the capability of optical sectioning of specimens, enabling the visualization of more detailed cell structures at higher spacial resolutions. This mode captures super-resolution 2D images at high speed with incredible contrast. TIRF-SIM mode takes advantage of Total Internal Reflection Fluorescence observation at double the resolution as compared to conventional TIRF microscopes, facilitating a greater understanding of molecular interactions at the cell surface. The Nikon N-SIM system allows multi-channel imaging with up to 5 lasers enabling the study of dynamic interactions of multiple proteins of interest at the molecular level. The cell is labeled green (kinetochore protein CENP-B), red (alpha-tubulin) and blue (DNA). By attaching two EMCCD cameras to the microscope with the optional Two Camera Imaging Adapter*, simultaneous two-wavelength super-resolution imaging with excitation of 488 nm and 561 nm is possible. * The actual product may differ slightly in design.